Today I had the chance to interpret for Zeng and the production manager about the technical aspects of the performance. 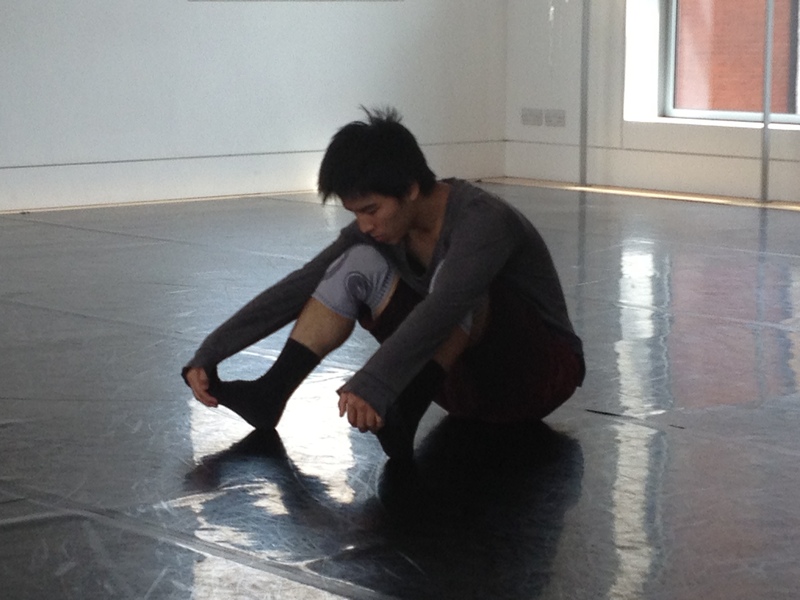 After the meeting, Zeng raised the question whether it is possible to cancel one of his rehearsals sometime next week? His point was, he thinks the formation of his piece is now completed, and the dancers are feeling ‘fresh’ about the set of movements. However, continuous repetition (more rehearsals) may cause a loss of ‘freshness’ to the movements, which could result in boredom that will affect the performance. Practice makes perfect, but excessive practice may reverse the positive impact. I wonder what the dancers think..? Interesting, yet we also know that in some processes pushing yourself through tiredness leads to great discoveries. In the particular work that Zeng creates, I wonder if Kenny’s exhaustion might have led to the dancer letting go of certain tensions that he is trained to hold, but which resonate with Zeng’s movement system that is strongly informed by his practice of taijichuan.